August 6th sees the premiere of a new piece by Chiara Beebe. 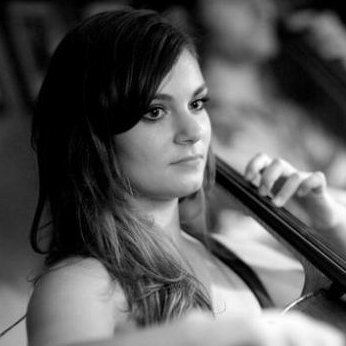 She is a 22 year old composer, cellist and singer born on Guernsey, whose piece A Return to Sarnia, based on a poem by Peter Kenny, will be performed as part of Terra Nova, an evening of modern and new music, by The Guernsey Sinfonietta. PK: So how did you get started as a composer? CB: Well, I only really began to consider myself a composer when I went to University – I found the way it was taught at school quite restrictive. At the University of Manchester it was taught in a completely different way that allowed me to express myself exactly as I wanted to with fewer boundaries. I was very lucky to have studied composition there with Camden Reeves who I cannot thank enough for his incredible energy and passion! I mainly enjoy writing for singers and strings (would you guess I’m a cellist and singer) because I think there is something very special about the use of words in music, but I do hope to keep writing a variety of pieces. PK: So what have you been working on lately? I understand you like music to be performed with a dash of theatre. CB: Yes I do. My recent compositions have included a setting of selections from Dante’s Divine Comedy, which was written for eight men and solo soprano. I often use space in my pieces and in this instance I placed the singers around the hall in a circle with the soprano solo on the balcony – reflecting the journey from hell to heaven and the circles of his inferno. This was the piece for which I was awarded the Proctor-Gregg Prize and I really enjoyed creating it. I also used theatricality in a piece for baritone solo, cello, trumpet and snare drum which used an extended metaphor of a bird as a prisoner of war. I feel that a lot can be added to music by using space as a parameter – it’s something that also makes the live performance unique and can captivate an audience. PK: I wish I’d seen them. Do you have a particular approach to composition? CB: I take influence from pretty much any experiences I’ve had. I play in a lot of orchestras and choirs and generally the repertoire I am playing at the time influences what I am writing. I like parts of all of the periods of musical history and think there is a lot to be learned from all of them, up to the present day – I try and listen to as many concerts of new music as I can. The music I write tends to be quite programmatic as I work best with a poem or story in mind, the tonality or nature of the music tends to come directly from the words or story and varies from piece to piece. I don’t have any special systems or method in my approach, but I normally do a lot of thinking and brainstorming, then do lots of sketches until what I want is clear in my mind. Then I’ll write it down and work from there. Compositions can always evolve and I always make sure I get second opinions and talk through it with friends, whether musical or not, to get a new perspective or clarify my ideas. PK: So tell me more about your new piece A Return to Sarnia. PK: I can’t wait to hear it at the premiere. I’ve seen the score, and as far as I can tell it’s a stunning piece. And I’m really flattered that you used some of my words of course. CB: No problem, I’m thrilled you allowed me the permission to do it. As soon as I lay my hands on A Guernsey Double I knew there would be something in it for me to use – what a fantastic collection of poetry. I have tried writing my own text before with little success so I am in complete admiration for what you do – I’ll stick to the music! CB: I love performing and composing music but I am currently pursuing a career in the music business. Having graduated from Manchester, I have now moved to Milan where I am studying for a Masters in International Business Management. I’m absolutely loving it out there, and my Italian is getting better by the day! I’ve also kept a little blog mainly for friends and family called Chiara Alla Milanese (which also translates as ‘Chiara in breadcrumbs’ but I thought that was amusing). It is a really fun way of keeping track of what life is like in a new country. Aside from the course itself, I keep myself busy with orchestras and choirs in Milan as well as playing and receiving tutoring at the Conservatorio Giuseppe Verdi and composing of course! I also currently work for Constella Ballet and Orchestra based in London, as well as for a composer of TV and film based locally and Music Connected, a social connectivity site for musicians which is in development and will be doing a six month placement with a production music company in Milan from January before I will move to London. As you can see I like to keep busy – I love all aspects of music and like to keep myself immersed in all of it! PK: Thanks Chiara… See you at the premiere! This entry was posted in A Guernsey Double, Guernsey, Music and tagged A Return to Sarnia, Camden Reeves, Chiara Beebe, Guernsey, Peter Kenny, Terra Nova, The Guernsey Sinfonietta. Bookmark the permalink.